Unfortunately Ivan and I are back to real life and our honeymoon is just a memory...but I can re-live it a little by sharing some more photos with you! 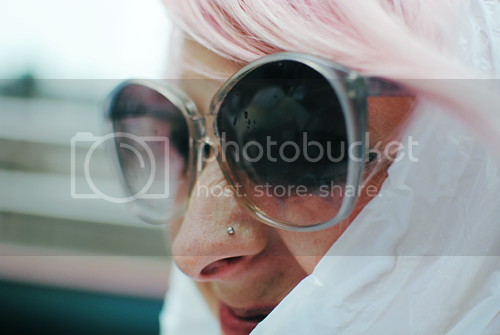 Here are a few peeks from our day on Sunday. It was kind of a gross rainy day but we made the most of it! What's that? Can't quite tell what's going on here? We got some goodies from babycakes. so yummy! Saw the statue of liberty from really far away. 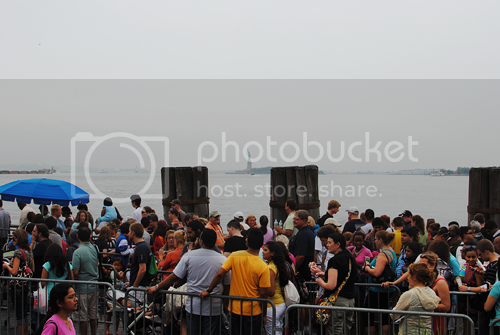 Neither one of us wanted to wait in line for the ferry to get a closer look. We are bad tourists! Rested our feet. I actually had to buy flip flops after the first day of walking around cause my toes were sore! Just fyi...While wearing these sandals I stepped in a couple NYC puddles, yuck! 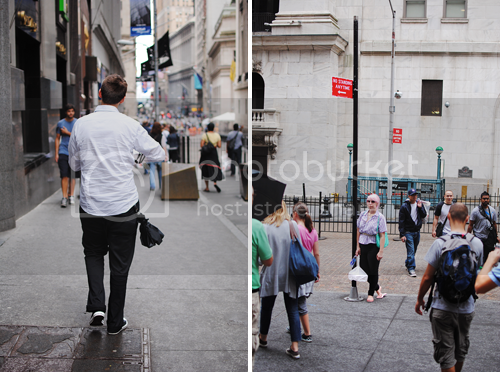 Checked out Wall Street and stood under a no standing sign. Made scrunchie 'I'm getting wet' faces on the bus ride back to Times Square. We also went to see a show on Sunday night but for some reason we didn't take photos of our super snazzy outfits! Let me assure you, they were snazzy. I have a few more photos to share from our trip so I'll be back! ha, funny you ran into the cat-on-head guy! i remember the first time i saw him. i think he's one of those oft whispered-about ny characters... a lot of my friends have seen him too. That cat guy is hilarious! None of my cats would cooperate with that kind of thing. 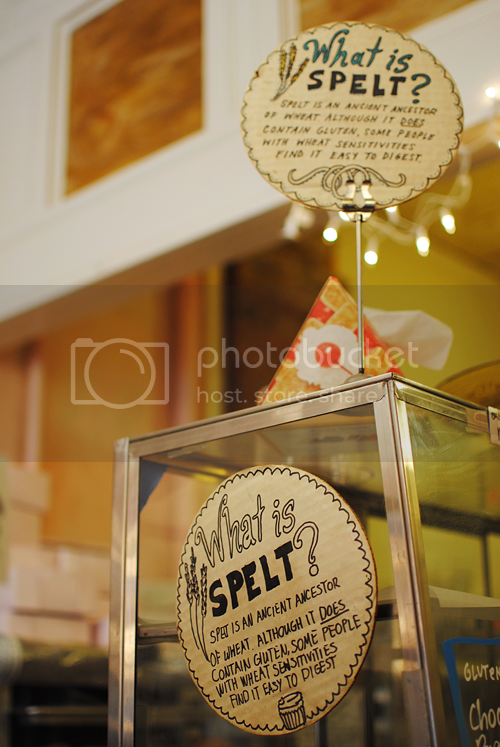 I love the spelt sign too, because I have a wheat sensitivity and I can eat spelt! I love spelt! The cat guy pretty much rocks. Just say'n. It looks like you guys had tons of fun! And now I want a cupcake. Oh my goodness that cat on that man's head! So awesome! In our old neighbourhood there was a guy who used to take his cat everywhere with him on a leash. And often she used to sit on his shoulders... Sometimes we'd go out for lunch and we'd see them both sitting in a little cafe, having a coffee together! But he wasn't allowed to take the cat into the grocery store so often we'd see her outside, just waiting for him. It was the CUTEST thing! Looks like you had a wonderful honeymoon! OH MY GOD. THAT IS AMAZING. I need my cats to travel on my head. HOLYYYY. 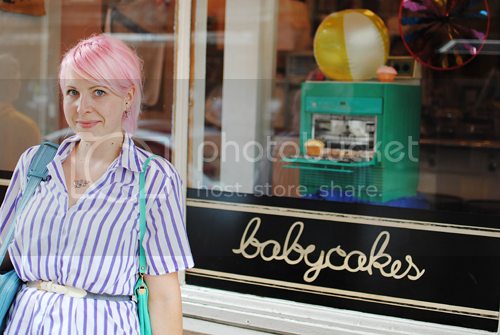 I'm so jealous you went to Babycakes! I am currently obsessed with trying every recipe in their cookbook. it looks like you two had a great time. i must train my cats to jump on my head, but seeing as how the barely respond when i call their names i don't think it will happen. and hey your pink hair is too cute! New York is such an amazing place! your photos brought back memories! I did have a bad experience when i was wearing flats with holes in them. It was raining and a man was puking in the street. I can only imagine what else was floating in that water and getting into my shoes! Sick! 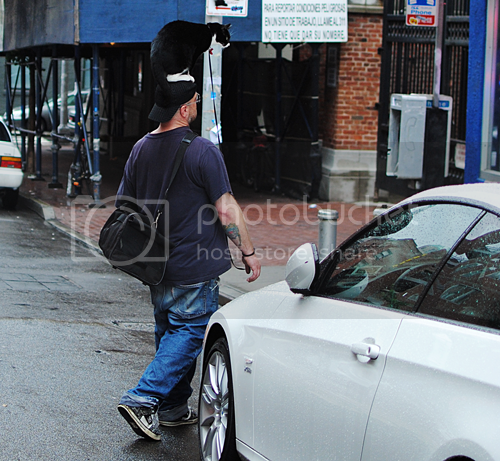 Too bad is was rainy, but I love the pictures (: That cat on the man his head is funny! And so is your "I'm getting wet"-face ;) Haha! that guy and that cat are pretty awesome! i love big cities! you always get such amazing people watching in! in the neighborhood where i work there is an older man, who is and will always be a metal rocker has a long mullet and walks around with a baby stroller, two huge speakers jimmy rigged on the stroller and a cat sitting where a baby should be and BLASTS metal music...and he walks around as if he hasn't a care in the world...pretty awesome! glad you had a great honeymoon sweetie!! cat on head man - too funny! How awesome is that? The guy with the cat on his head is amazing! Soooo cool - next time you see him (all good things come in triplets) please ask him how he managed to train his cat, so that I can try and train mine, too! Oh, and I love your last pic, it's so stylish! That cat guy is amazing! I definitely laughed out loud. And I really like that last picture of you! Pictures with scrunched noses are my favorite, I have no idea why. I can't believe your rebellious ways! Standing under a no standing sign? You should be arrested! HEHE. That cat is pretty rad. Um... the cat-on-head guy basically made my day. Thank you for capturing that interesting sight! 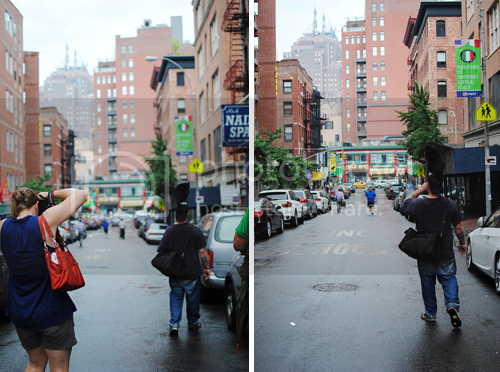 I love going into cities and seeing people doing strange things. I saw a guy with a kitten living beneath his dreadlocks when I was in Chicago for a concert. I didn't realize there was anything there until something started moving underneath his hair! he just walks around and people give him a dollar to take a pic with him lol. 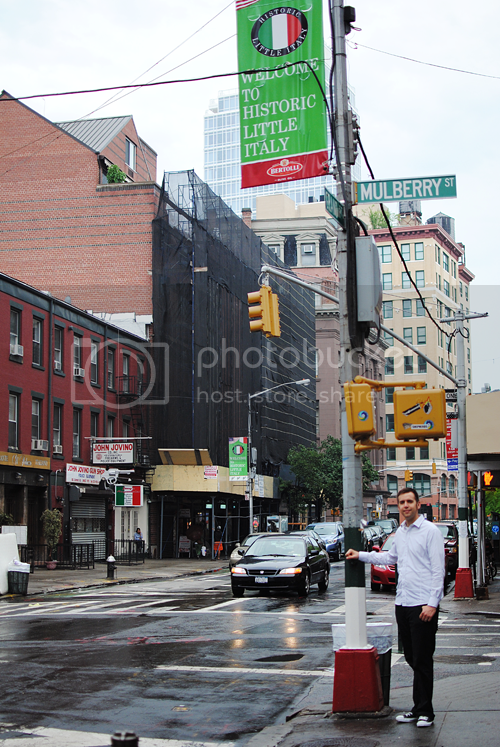 I am sorry that mulberry street is not like it used to be.Italian.Now it's everything else but italian. I wish i saw u walking around Ny! Love the cat dude. What a fantastic trip. Wow! The cat on the head guy is amazing! Looks like you had a great honeymoon :). wtf with the cat on top of the guy?? lol thats hilarious! I've always been a bad tourist in NY I also saw that lady from far away, so much things to do in NY to waste it on that line! That cat on the leash made my life!